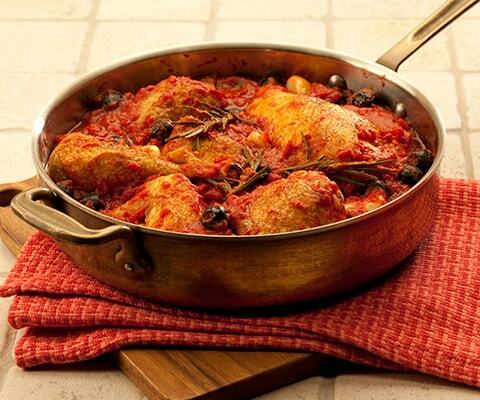 Prepare this traditional Italian favorite for the whole family. Serve with warm crusty bread and freshly grated Parmesan cheese. Cook pasta according to package instructions. Drain and keep warm. Meanwhile, heat 2 Tbsp. of oil in a large skillet over medium high heat. Cook onion, green pepper, red pepper and mushrooms for 6 to 8 minutes, or until tender, stirring occasionally. Remove from skillet. Heat remaining 2 Tbsp. of oil n the same skillet over medium high heat. Brown chicken in oil for 2 to 3 minutes on each side. Stir in Pasta Sauce and vegetables, and bring to a boil. Cover, reduce heat to medium low and simmer for 10 to 12 minutes, or until chicken is cooked through, stirring occasionally. Serve hot with cooked pasta. If desired, substitute Classico Tomato & Basil Pasta Sauce with Classico Four Cheese Pasta Sauce.